If you are on social media, you’ve probably seen many people who have selected words or phrases to signify what they want to create in their lives for the upcoming year. Selecting one word creates clarity, separates the wheat from the chaff, and clears the noise we have going on in our head. The word “JOY” is my guiding north star for the new year. Now, I’m filtering every decision I make through the question as to whether or not this choice will bring me closer to or farther away from joy. The question could be as complex as something about my own personal relationship advice or as simple as what to do with my free time. Seems like once I picked the word JOY, the universe is having fun with me. And I’m en-JOY-ing it. Since I’ve made this decision, I’ve met two JOYs. One JOY, who I’m now collaborating with, is building a community of Newly Single Women – providing a place to get Q’s answered, providing resources and information to reduce the overwhelm for women who find themselves suddenly single. We are a perfect fit to have met. The other Joy groomed my sweet pup, Sparky. He left not feeling stressed at all, which gave ME great JOY, as he’s usually traumatized by the whole experience. So what word have you chosen for 2018? Or have you? Do you think the whole thing is a bunch of hooey? We, as humans, crave rites of passage to mark our time on earth. The New Year is a moment that offers us a space to reflect on what we are doing here, are we fulfilled with what we are doing, why we are doing it, and who we are doing it with. Which brings me to my next BIG revelation. If you’ve ever heard Simon Sinek’s Ted Talk about “Start With Why” – it’s a powerful learning. His examples are intellectual. I fully understand and appreciate them. However, recently, I participated in a Vision Board workshop held by Trez Ibrahim of Life Mastery Solutions (who will be soon opening up her Manifest Your DreamsCoaching Program) and she showed us a video of a comedian who brought the “Know Your Why” to LIFE! Michael Jr’s example is VISCERAL. Watch now. 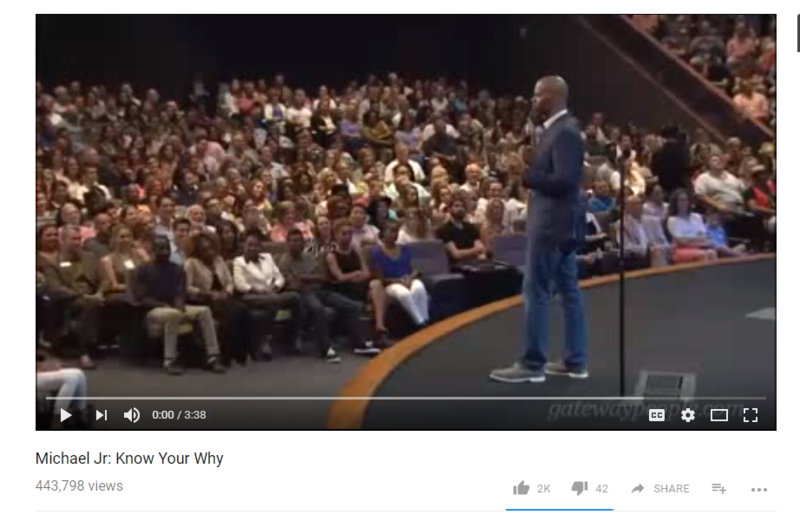 After I saw this video, my decisions about JOY or NOT JOY – also became focused on WHY am I doing what I’m doing? And while this might seem to confuse the issue, it actually further served to clarify my decision-making process. Going to these classes, my WHY is to get my FITNESS back, not only to get my range-of-motion back. HUGE difference. Does it bring me JOY to go to these classes? YES!!! Because being FIT brings me JOY! Are you happy with your life? Are you dating or in a relationship that’s bringing you happiness? Maybe you’re a successful woman who wants to know how to get a man who is a good communicator, who is stable, committed, healthy, supportive, and a good partner? What are your WHYs for WHAT you are doing? You are responsible for your own happiness. Every choice you make leads you closer or farther away from that happiness. What decisions could you make now to be happier? Did you know that the most successful people in the world hire advisors, consultants or coaches? Fortune 100 CEOs, Olympic and professional athletes, and Hollywood actors all work with high-priced coaches and advisors to increase their performance. In fact, the people who invest the most money typically get the best results – because you are investing in your most important asset – yourself. AND those who pay, pay attention. You could get fabulous advice from a friend or colleague and have it resonate. You think it’s spot on. But would you actually follow it? Probably not. You have no accountability. No investment. No skin in the game. When are you going to step into your fullest life ever? All the possibilities that are waiting for you? I know how painful it can be to feel alone like you aren’t living the life you thought you’d be living at this point. I struggled, too. And I also know how liberating it feels on the other side. I no longer lie alone in bed at night wondering if I’m going to die alone, ruminating on how I’m nobody’s first priority. Finding my life partner and being married is, of course, a huge part of that liberation. But more than that, I’ve come to a place of peace that has nothing to do with having a partner by my side today. It’s coming to terms with my SELF and ACCEPTANCE of the unknown. What I do now is help women who are successful at work and in every other area of their life yet who struggle with romantic relationships, to create and sustain healthy, committed, deeply loving relationships. The first thing I’d love to know is: does my work speak to YOU? Are you one of the women whose life I can help transform? Do you want to stop struggling with relationships, uncertain why they aren’t working out, and finally go the distance with the RIGHT GUY this time? If so, call me now for a complimentary BREAKTHROUGH phone session 949-682-9304 Or email sharon@drsharoncohen.com . I’d also love to know if you know anyone who is struggling with love and could use the guidance and support of someone who has been there, who knows the path, and who wants to share it with compassion. If you do, please tell them about my work. I work with women from all over the world and I know I can help. Wishing you all the best! Thank you SO MUCH for your support and I hope to hear from you soon!